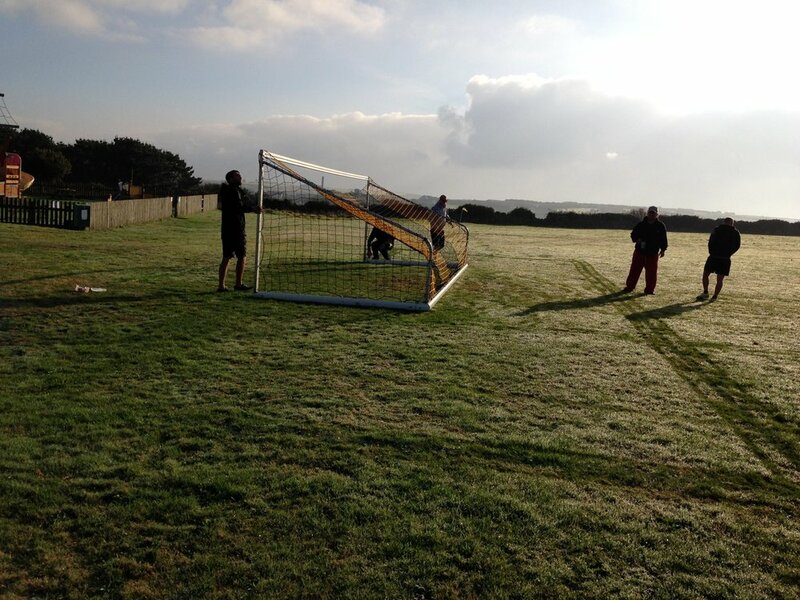 The goals being setup ahead of play. The Garrison Gunners beat the Woolpack Wanderers 5-4 in a dramatic penalty shootout to settle a remarkable 5-5 game and win the Charity Shield. It was heartbreak for the Wanderers who pulled back 5 goals in the second half - the equaliser coming in extra time from Will Lethbridge. He would go on to miss the penalty, which would lead to the Gunners win. It was a beautiful morning on the Garrison Field. Clear, dry, sunny and slick with a light dew – excellent conditions for Football! Referee Paul Charnock was back to oversee the game. The Gunners kicked off right to left and in the early stages, there wasn’t much between the sides. Both the Gunners and Wanderers kept the ball well, passing, moving and creating a few half chances. It wasn’t long though before the deadlock would be broken. A clever through ball caught the Wanderers napping. Corey Graham ran through the channel, took a touch and struck the ball hard and low to beat goalkeeper James Wignell at the near post to make it 1-0 to the Gunners after 10 minutes of play. No chance for the keeper – a very well taken goal. It wasn’t long before the Gunners made it 2-0. The ball went out to the right and was squared back from the by-line for Adam O’Neill to finish high into the centre of the goal from close range. The Gunners third followed soon after. A good passing move and through ball found Jack Handy who stayed composed and slotted the ball past James Wignell. Despite the scoreline the Wanderers continued to move the ball well, stringing passes together, using the full width of the pitch. They created some good opportunities, which either went wide or were matched by Gunners keeper Matt Simons. Corey Graham added his second and the Gunners fourth with another well-taken finish from a slick counter-attack. It felt like it really wasn’t going to be the Wanderers day! 4 - 0 to Gunners at the break. As the Wanderers got the second half underway you would have thought their spirits would be down but they got off to a good start. They created a few chances forcing Matt Simons in goal to produce a few excellent saves. They ultimately got caught out on the counter. Too many men forward, ball over the top for Jack Handy slot home and get his second of the game. 5-0 to the Gunners after 55 minutes. It was looking like it was going to be a long second half for the Wanderers but things were about to change. Soon after the restart the Wanderers continued to mount pressure and got what they deserved. Sam James picked up the ball on the left, moved it inside to Will Lethbridge who squared it to Dan May who exquisitely curled the ball with the outside of the boot over Matt Simons from the edge of the box. Momentum seemed to be changing and it wasn’t long before the Wanderers made it 5-2. A good move started by captain for the day Jack Stone, made its way out to Zach Hick and then on to Sam James who knocked the ball inside to Will Lethbridge on the edge of the box. He turned looked for the pass and then hit one hard and high slightly to the right of Matt Simons into the roof of the net to make it 5-2. There seemed to be a sense of urgency and the Wanderers started to believe the comeback was on. Even though the Wanderers were continuing to push forwards it wasn’t one-sided. James Wignell in goal made some good saves putting his body on the line to keep the Gunners out and Jack Handy had a goal disallowed for offside, which would have killed the game. The third goal came with just 15 minutes of regular time to go. Dan May picked up the ball just outside the box on the right and superbly lifted it into the far corner. Matt Simons in goal was stranded and couldn’t do anything about it. 5-3 to the Gunners. As the game moved into the final stages both teams were going for it. Despite tired legs and Gunners were looking threatening on the break and knew another goal for them would end any comeback. They eventually started to play with more men behind the ball aiming to stifle the Wanderers attack as the final whistle loomed. With 10 minutes or so to go the ball was moved out to Sam James, who ran into space on the left. He took a couple of players on and whipped in a teasing ball across the 6-yard box to Will Lethbridge who took a touch to control it before tapping in at close range to make it 5-4! The drama wasn’t over with the Gunners sitting back and the Wanderers pressing for an equaliser, which would eventually come in extra time. Scot Reid who had a good game and caused problems throughout picked up the ball on right. He slid a perfectly timed ball down the channel to Will Lethbridge on the right of the penalty box, who took a touch, hit the ball into the far corner side netting to grab a late equaliser, completing his hat-trick and an incredible comeback. There was barely any time left after the kick-off. 5-5 at full time and straight to penalties. The first 2 penalties were calmly converted. Will Lethbridge stepped up to take the second penalty for the Wanderers only to skew it wide! As the shootout continued both teams put their next couple penalties away in a composed manner. Some of the younger players stepped up and converted them with ease making it 4-4 on penalties with 1 remaining penalty for the Gunners. Adam O’Neill had the chance to win the Charity Shield for the Gunners. He coolly hit the ball into the top corner past James Wignell. Garrison Gunners win the Charity Shield 5-4 on penalties after an action-packed 5-5 all draw. First of all, a big thank you to all for turning up - it really was a thoroughly entertaining game! Thanks to Paul Charnock for refereeing. Good performances again from all the youngsters with Corey Graham and Jack Handy bagging a couple of goals each for the Gunners. Scott Reid and Sam James out on the wings had good games for the Wanderers creating havoc for the Gunners particularly in the second half. James Wignell in goal for the Wanderers produced many fine saves and commanded his area tacking a whack to nose in the second half! Matt Simons also produced some great saves for the Gunners during the game. Will Lethbridge grabbed a fine hat-trick but missed the penalty that ultimately cost the Wanderers the game. Jack Stone filled in at centre-back, made some great tackles and brought the ball out well for the Wanderers. Anthony Gibbons and Liam Greenlaw were at the heart of everything for the Gunners getting stuck in, winning the ball in the air the majority of the time and moving it out from the back. Adam O’Neill got the Gunners their second goal, scored the decisive penalty and played well throughout the game. Man of the match this week though Dan May. First game in over 12 months, 2 fine goals, both from outside the box and a commanding performance in the centre of midfield.